If most fans or pundits would’ve been told that Monster Energy Kawasaki’s Eli Tomac would finish every race but would be without a single win after four rounds of racing (prior to the San Diego Supercross) they wouldn’t believe it. But it’s true. The question is, why? 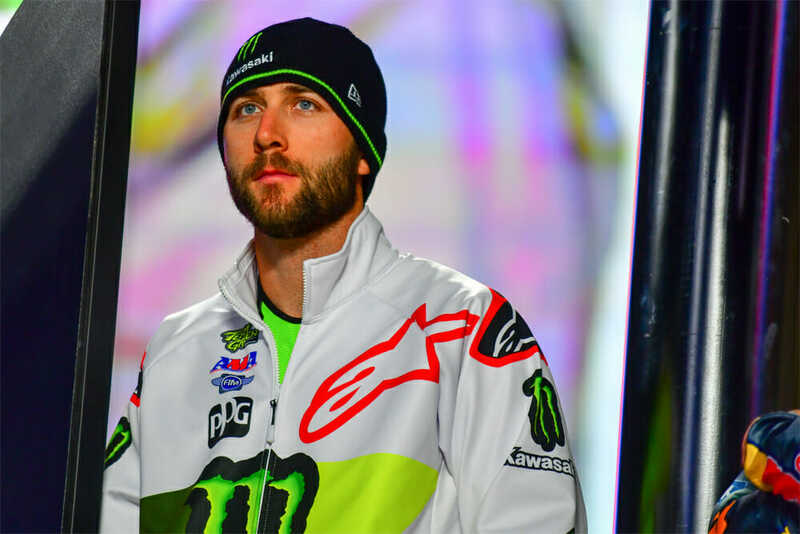 Is Eli Tomac waiting to attack? Click here to read this in theCycle News Digital Edition Magazine. That’s not easy to answer, because the only people who know for sure are him and his team, but I’ll break down the possibilities and probabilities here. First off, there was a rumor in the off-season that Tomac suffered some kind of injury to his back. Back injuries are a tough thing for a lot of reasons, but suffice it to say, supercross and motocross are tough on your back even when your back is healthy. Jake Weimer had a back injury for the last handful of years he was racing, and whether or not it slowed him down, he had to adjust his training to do a lot more core exercises than he would do otherwise in order to support his chronic back injury. Regardless of whether it actually cost him any level of racing success, since it was something he specifically had to train for, it’s safe to say that it was at least on his mind, and that alone at the top level of racing can be the difference between winning and losing. And the other potential issue with even a relatively minor injury is that if it’s enough to prevent a racer from racing at absolute 100-percent of the speed they’re capable of racing, their bike setup also tends to suffer. At the top level of the sport, they spend countless hours training and testing to get the bike to work perfectly for them at their exact size, speed and riding style. As soon as a racer has to come down off of that edge even just to 99 percent, the motorcycle settings (especially chassis settings) that worked at 100 percent cease to be comfortable. And the fix is often not as easy as you’d think. So, it’s possible that Tomac’s back is good enough to race with, but is still just enough of a factor that it keeps him from riding on the edge he’s used to riding on. And if that’s the case, it’s possible that even at his current level, he can win, but his bike’s settings haven’t yet come to equilibrium with his current riding capabilities. After all, there have been plenty of times in the past few years that Tomac has been seconds per lap faster than his competition. That said, it’s also entirely possible that his back is actually fine (and maybe just cost him some testing time in the off-season), and that he simply hasn’t found his happy place with the factory version of an all-new Kawasaki KX450 for 2019. Yet. But there’s one final possibility, and that’s the one I’m hoping is true: He’s just a veteran now and he’s learning that you don’t have to win every single race by a minute in order to win championships. He might just be a smarter racer now. And the thing is, his being a smarter racer now doesn’t mean that the other things we already touched on (bike setup or a potential lingering injury) can’t also be true to some extent or another. It’s actually pretty rare that racers at the very top level of our sport are “healthy” anyway. Walking through the pits, you have to be careful not to get to “handsy” with these guys, because you never know when you’re going to touch a sore shoulder or wrist. They’ve almost always got some kind of nagging injury here or there, but the question is whether the injury is bad enough to actually slow them down on the track. But if you analyze the past couple seasons, Tomac has made early mistakes that really cost him as the championship rolled along. And impatience seemed to play a role in these errors. In 2017, he came up five points short of Ryan Dungey, and you can narrow that down to his disastrous race in Arlington, where a fall resulted in a damaged front-brake assembly and a 15th-place finish. He had more trouble later in the year, but that wouldn’t have mattered without the poor race in Arlington. Then, in 2018, Tomac was running away with round one when he simply missed a rut in a corner and went down pretty hard, and pretty awkwardly. This led to a DNF and then a DNS at round two (from lingering injuries from the first race). He then won two in a row, struggled again, won a couple more, etc. In the end, he was way out of the title chase. But this year, so far, he’s gone 4-3-4-3 without looking like he has been in much of a hurry at all so far. Certainly, he wants to win, but unlike in years’ past when Ryan Dungey (2017) and Jason Anderson (2018) were putting in consistent rides, and wins, nobody has begun to run away with it yet in 2019. In fact, after his 4-3-4-3 scores, he still sits just three points out of the championship lead after four rounds. In 2017, after four rounds he was already 20 points behind defending champ Dungey (who had gone 2-2-1-3 in the first four rounds), and in 2018 he was already 36 points out of the title chase after four races were run. And in both of those seasons, after four races, Tomac had already won (one in 2017, and two in 2018) main events.